Brushes are components which are used to transfer electric power from a rotating component to a fixed circuit or vice versa. They are used widely in rotating electric machines such as motors, generators, etc. 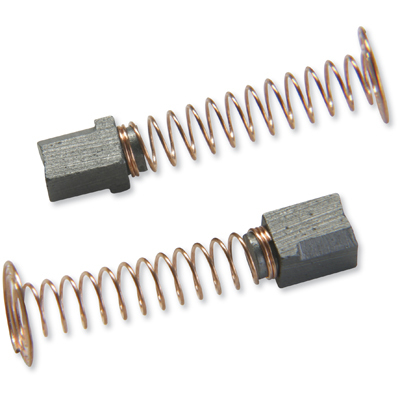 In DC motors, brushes are used along with commutators to change the direction of the current. In AC synchronous machines, brushes are used to transfer DC power to the rotating poles for excitation. The brushes are made of carbon or copper. Copper has a higher conductivity than carbon and thus is preferred for low voltage and high current applications. It also has high mechanical strength and longer life. However, the downside of copper is that it wears in a un-uniform manner. The dust caused by the wear can cause arcing and can damage the commutator surface. Carbon is soft on the commutator surfaces and it is smoother as it has good lubrication properties. However, it introduces a large voltage drop across the contacts. Most brushes today have a mixture of copper and carbon.